Vegetarian kababs are much revered for their meaty texture and protein content. Many meaty vegetables can be made into delicious kababs along with some lentils, chickpeas or even cooked beans. Lentils provide a textural base while the fibrous vegetables add the meatiness to these vegetarian kababs and they are great in their own way. 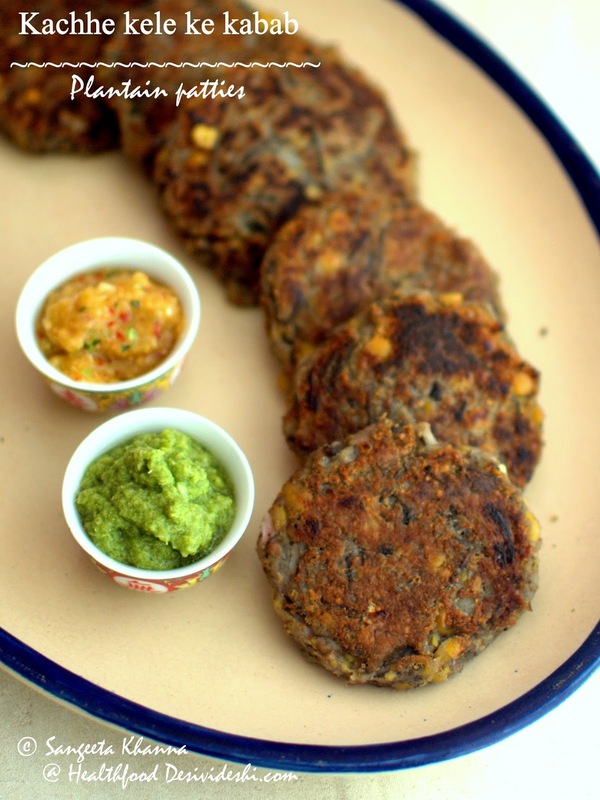 There have been times when I have chosen a vegetarian kabab over the meat kababs as the flavour variation can be very interesting sometimes in the vegetarian kababs. We keep making Kathal ke kabab and kachhe kele ke kababs quite often, but these kababs happen only when the vegetable in question has to be finished and we are in no mood to eat subzi. 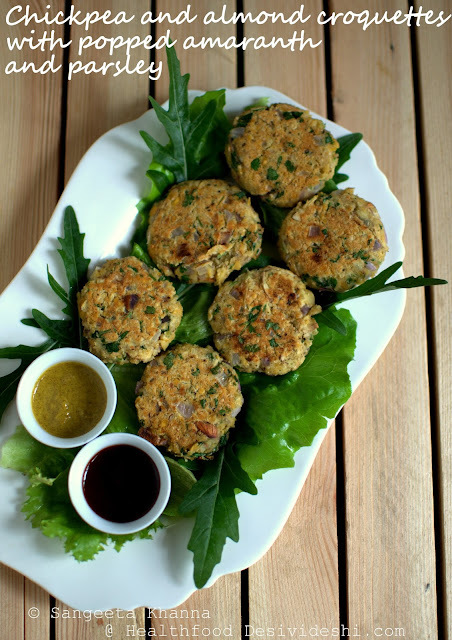 Lentil and nut kababs are made occasionally when we make it a meal with some salad. I even make chickpea kababs quite often to use up any refrigerated boiled chickpeas. Only sooran ke kabab is made on special occasion of Diwali as a tradition and we look forward to it. This time a young client of mine who is a beginner cook wanted a detailed kachhe kele ke kabab recipe and some raw plantains were going almost black in the fridge. There was no excuse why I should not post a recipe for the girl. I got them plantains peeled and boiled with chana daal (split chickpeas) to make kababs but again the boiled mix kept waiting in the fridge for 2 days. Finally I made the kababs for a late weekend breakfast. Yes that is not a traditional kabab time but we can decide our own foods at home. 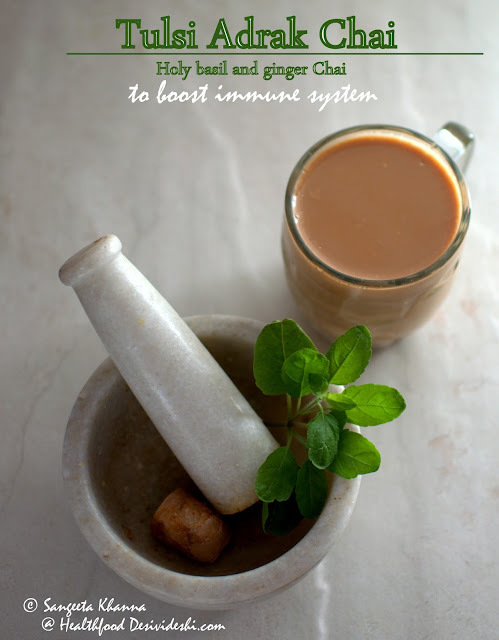 Just some chutney and tulsi ginger chai was great with these kababs. The resistant starch in the raw plantain (kachha kela) and a good mix of complex carbs and proteins in the chana daal makes these kababs perfect for breakfast if you consider the nutrient profile. That day after this late plantain kabab breakfast we had a grapefruit smoothie for lunch, a couple of teas later in the evening and did not feel like eating any food till dinner time. The hard variety of raw plantains take longer to cook and the slender ones cook faster, so I normally use soaked chana daal for slender plantains and raw unsoaked chana daal for hard plantains. This time I had some mature hard plantains. Peel the plantains using a potato peeler so most of the fibrous skin is retained. Peel off only a very thin layer, removing any blackened parts well. Slice the plantains in 1 inch thick pieces. Rinse the chana daal and mix with plantain slices, put these in a pressure cooker, add salt and 1/2 cup water and pressure cook till done. It takes about 10 minutes after the first whistle. Cool, open the pressure cooker, discard any extra water and mash the mixture. Normally all the water is soaked up while cooking. Add the rest of the ingredients (except ghee) and make a dough. If the mix feel too watery you can add some sattu (roasted chickpea powder) and adjust seasoning. Now this dough (mix) can be refrigerated for 2-3 days easily, kababs can be fried when required. Divide the dough into 8 parts, shape into kababs and shallow fry on a hot griddle with drizzles of ghee, till browned on both sides. If you want a smooth kabab like galouti you can blend the kabab mix in food processor and skip adding onions. Serve with chutney of your choice. We had it with kachri ki chutney and amla dhaniya patta ki chutney. Kachri is a tangy tart small melon that lends well to chutneys with loads of garlic and chillies. Amla was chutnified with some dhaniya patta (coriander greens) and chillies. 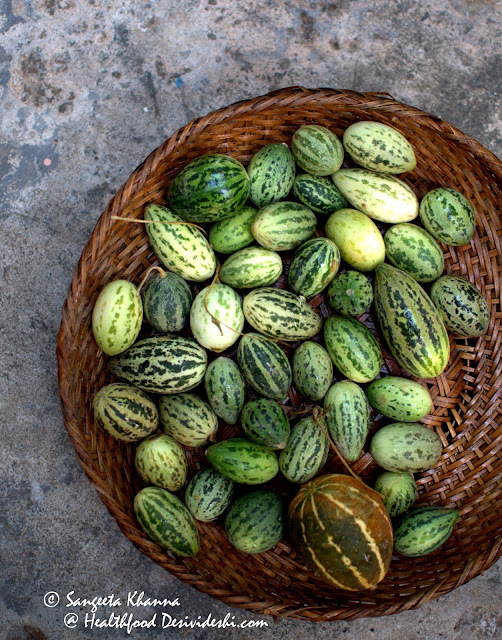 Here is a picture of kachri, the melons (Cucumis pubescens) that grow all over India wherever there is arid soil. More on this small melon later. It will be good to know that dehydrated kachri powder is used as a meat tenderizer and some mutton kabab recipes use the kachri powder for the purpose. 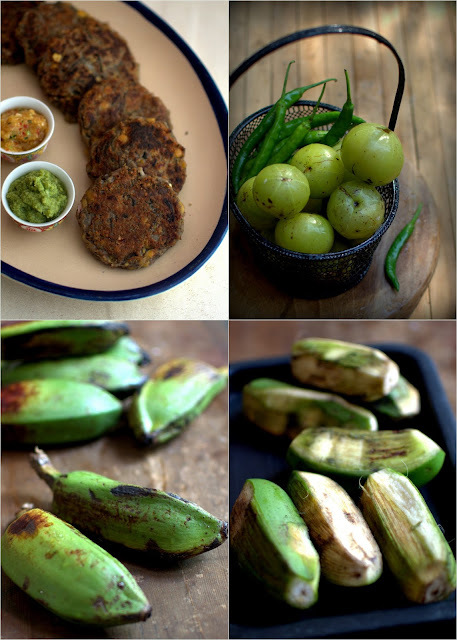 It was a coincidence that a kachri chutney came up with a raw plantain kabab, kachhe kele ke kabab as we call them.